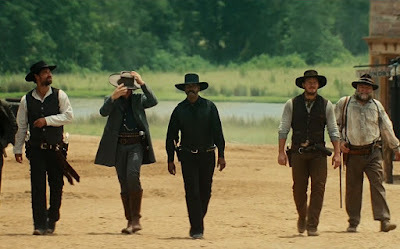 Seven gun men in the old west gradually come together to help a poor village against a gang of murderers and thieves. 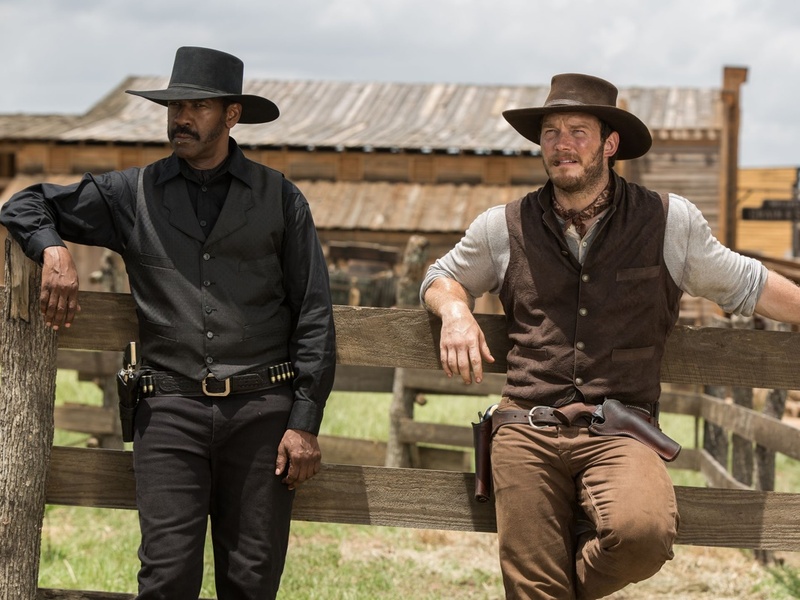 The Magnificent Seven marks Antoine Fuqua’s first foray into the Western genre. It’s the third time however that he has teamed up with Denzil Washington after The Equalizer (2015) and Training Day (2001). This movie is a remake of the 1960 classic starring Yul Brynner and Steve Mcqueen et al, which in itself is a remake of the legendary movie Seven Samurai (1954) directed by one of the masters of cinema, Akira Kurosawa. It’s been a while since a Western featuring such a strong cast has surfaced. Westerns though are timeless. Within the genre itself, directors can choose which path to take. Whether it be action-orientated, a quiet character study piece or even a comedy. It’s one of the most diverse genres in Hollywood. ​Hanging it’s hat in September therefore as opposed to a full stand off in front of the townsfolk with some of the bigger spectacle movies of the summer, led me to believe that this movie was not really summer box office material. 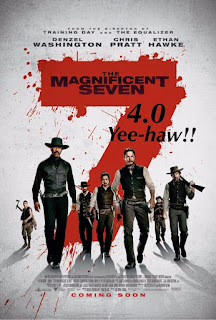 Well, nothing could be further from the truth, The Magnificent Seven would have been probably quicker on the draw than most summer movies. I had a great time with this movie. Before I get into some of the specifics, it was just great to see a Western again. Western’s are one of my favourite genres. At the heart of the movie is of course the seven men who slowly come together throughout the first act. There is great chemistry throughout the group. Denzil Washington who largely plays Brynner’s character (Although different name) is sublime in the lead. Economy of movement, expression and emotion. I felt he played this part in a very similar way to his character in The Equalizer last year. Subdued confidence. He was superb. Chris Pratt as Josh Faraday a sharp shooter with a penchant for card tricks and magic was also very good, but at times I felt he was a little misplaced, a modern man in a period movie. Vincent D’Onofrio was also excellent as Jack Horne a high pitched one man axe wielding band who decides to join the gang to help fight the bad guys. Ethan Hawke and Byung-hun Lee also had excellent chemistry as a double act who made two more of the seven. Manuel Garcia-Rulfo as Vasquez an outlaw of Spanish decent and Martin Sensmier as Red Harvest a Native American round the posse off nicely. On the flip side, Peter Sarsgaard as Bartholomew Bogue the movies main antagonist is effective but underused. He's a nasty piece of work make no doubt, but his character is not really developed. Is therefore one note and ultimately comes off as a weak villain. As for the movie itself it is beautifully shot, featuring stunning vistas and brilliant tracking cinematography. Kudos to Fuqua for producing such a competent looking Western fresh out the gate. The score which was originally slated to be solely completed by James Horner had to be rounded out by Simon Franglen after the tragic and untimely passing of the great James Horner. The result is the score is nicely understated with a catchy signature tune that develops throughout the movie. For those of you who pine for the classic original score by Elmer Bernstein, fear not stay sat during the end credits and you can sing to your hearts content. There is a nice light touch that trickles throughout the movie with some great moments of humour. Predictably most come from Pratt’s character but D’Onofrio is also very funny. There is also a particularly humorous scene when the gang train the town on how to defend themselves. After the relevant graphic violence as well of last years The Equalizer, I thought that Fuqua would similarly take his opportunity to make his mark in this genre. He decides though to damp it down with the majority of the violence taking place off screen, firmly placing this movie in a more accessible position for families with older children. I highly recommend The Magnificent Seven, will it be seen as a classic Western in years to come – no. But hopefully it will be seen as the movie that breathed new life into a timeless genre. Antoine Fuqua set out to make a balls to the wall action adventure and in that, indeed he did. So saddle up, partner - the boys are back in town. The Magnificent Seven is on general release in the UK from today.